It would appear that, with the introduction of the Facebook timeline for brand pages, there are a few features that will no longer be available. With just one month left for Facebook page admins to get their content in order for the new layout, it would appear that one of the first things you’ll notice are gone are the landing tabs. The immensely popular landing tab, which has been used to introduce potential fans to your brand, has been used for giveaways, and for the somewhat controversial like-gating, will become a thing of the past. Pretty much any extra tabs that you could add to your Facebook page are no longer available, but you can display your apps next to your profile picture, along with photos, likes and more. This will no doubt be an issue, not only for page administrators who have gotten so used to using the feature, but will also affect quite a few marketing companies, who have built and monetized services around Facebook’s landing tabs, in particular. It’s not just the frontend that is undergoing major changes. Administrators will have to get used to quite a few significant changes in the backend as well. Checking out the new Manage Permissions tab on the backend, you’ll see that quite a few options have been removed, while a few new features have appeared. While posting ability for fans is still the same – posting to the timeline, or adding photos and videos – you now have a little bit more control over the visibility, administrators now have the ability to review content on the page before it is displayed. Meanwhile, the option to manage your own translations has disappeared from the list. Facebook administrators also have a shiny new Admin Panel to play around with. One of the most significant changes, which you can see in the screenshot below, is that you now have the option to receive messages, as we had mentioned before, via your Facebook page. 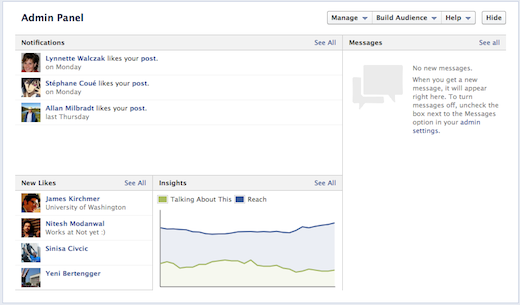 The Admin Panel will also feature your latest notifications, new likes and even a little bit of analytics to boot. Another change we spotted, although it may just be a bug, is that Facebook Questions don’t appear to be working any longer. The feature, which allows you to conduct polls and ask your fans all sorts of questions, is still visible in the Apps Panel, but is currently inaccessible, and the description has disappeared. Of course, with the new timeline, Facebook pages will get a lot of the features we’ve already gotten used to over on our personal profiles including cover photos, the ability to add milestones to the timeline, pin posts, view friend activity and view your own activity log. With the new activity log, administrators also now have the option to hide posts from their timeline. There are a couple of brands we’ve already spotted who are already using the new timeline feature to celebrate their brand’s history. Tiffany and Old Spice have really unlocked all of the potential that the Facebook timeline has for brands, highlight their milestones. So while there may be some major changes on the way, and many brands and social media managers will no doubt feel the growing pains, it’s definitely worth it if you want to show off your company or brand’s rich history. What do you think of the changes Facebook is making to its brand pages? Let us know in the comments.